This morning I was watching Peppa Pig with the little one, well not watching, more having it on in the background to keep her entertained whilst I ran around like a crazy person trying to leave the house. The episode that was on was “Baby Alexander” and it got me thinking that Peppa is actually telling some truths when it comes to babies and parenting. So, here is the world of babies according to Peppa Pig. When you visit anywhere with a new baby you will literally take everything with you, far more than you actually need. This includes nappies, toys, baby wipes, books, the sling, the buggy, a travel cot, sometimes a high chair, feeding cushion, the bouncer, a play gym, literally the list is endless. Most of the time you don’t need or end up using half the stuff that you have packed, and you kick yourself for having crammed that extra bag into an already packed car. Although I can say that as your baby gets older you need definitely less, or you just know what you don’t need. 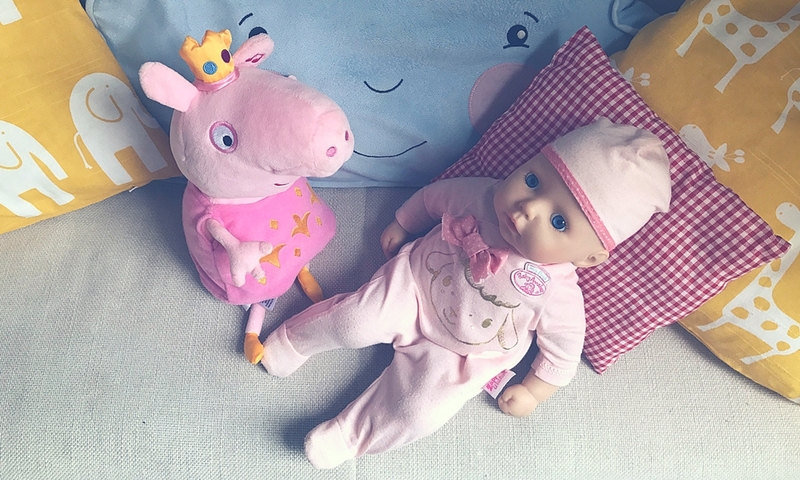 Yep, Peppa is right, they cry and they are noisy, especially in the beginning as you are wondering how such a small thing can make such a loud noise. In early days of having a newborn baby we often have no idea why they are crying; are they hungry, are they tired, are they too cold, too warm etc. It’s up to us as parents to figure out what these cries or screams actually mean, but as they get older we slowly start to learn, and usually it’s food that they’re after. Whatever way your feeding your baby, or even if you’re at the weaning stage, feeding is something that will take up a lot of time. It also has it’s challenges, so whatever way you can get food into your child’s mouth then so be it, whether you’re breast feeding or bottle feeding it doesn’t matter, just as long as your baby is being fed one way or another. Older children seem to think that your baby can do everything, and that they can play. Any time before they can sit up will probably seem very boring to an older child, who may expect a baby to interact. However having said that I’m pretty sure that I used to say to my 3 month old “Do you want to play with this toy car”. Their first word is always a special milestones after lots of coo-ing and ga-ga-ga. Just like playing with toys, older children or toddlers may think that babies can talk. The first word milestone takes time, and how bad am I that I can’t exactly remember when our little one started talking, I think it was around 9 months with “Mama”, but don’t worry they will talk eventually. At the near age of two I am just about getting sentences from the little one, and lots of words. This old chestnut. Competitive parenting. It’s something that we see all the time, in fact I’m probably guilty of it. I think that in a world where we all want the latest stuff, and where it’s being shoved into our faces via ads and social media, I kind of think that competitive parenting is fairly natural, and helps to keep you on top of your game. So, in the words of Peppa Pig I think she understands babies and parenting quite well. Oh and in case you’re wondering what Baby Alexander’s first word was, it was “Puddle”. Sorry to spoil the surprise.